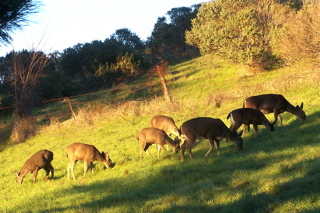 With my neighbor’s housecat keeping them company, eight blacktail deer spent Wednesday afternoon grazing and chewing their cud in the fields around my cabin. 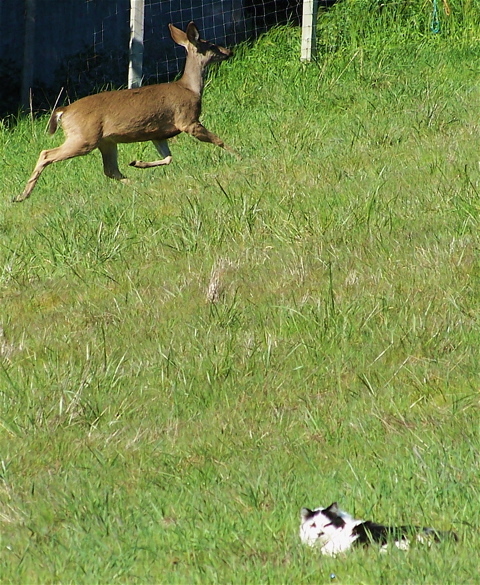 Housecats don’t bother blacktails, unlike the coyote that crawled through my fence in January and caused the deer to immediately scatter. 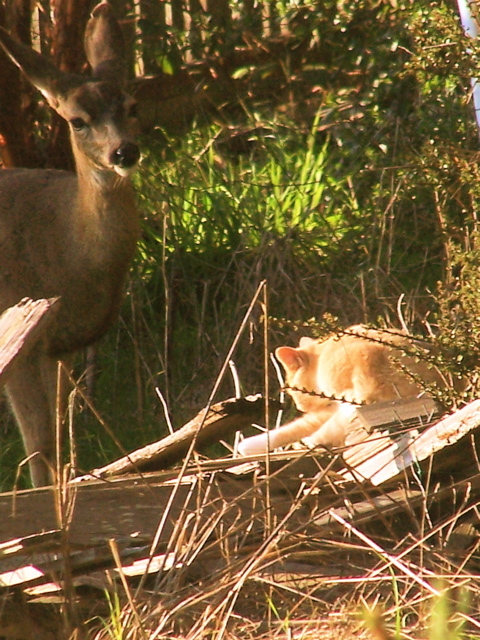 A blacktail doe watches a housecat on a woodpile washing itself. What does all this mean? “Deer is a commonly cited example of a semantic process called specialization, by which the range of meaning of a word is narrowed or restricted [over time],” the dictionary explains. Based on DNA tests, Morris adds, “researchers theorized that whitetails (Odocoileus viginianus) emerged as a separate species on the East Coast about 3.5 million years ago. A blacktail buck, characteristically stretching his neck low to the ground, sniffs for a doe in estrus. “They apparently expanded their range down the East Coast and then westward across the continent until reaching the Pacific Ocean in what is now California some 1.5 million years ago. 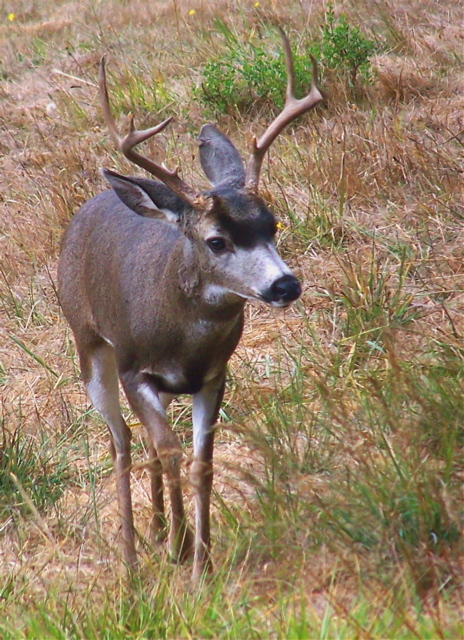 Moving north up the coast, they evolved into blacktails…. 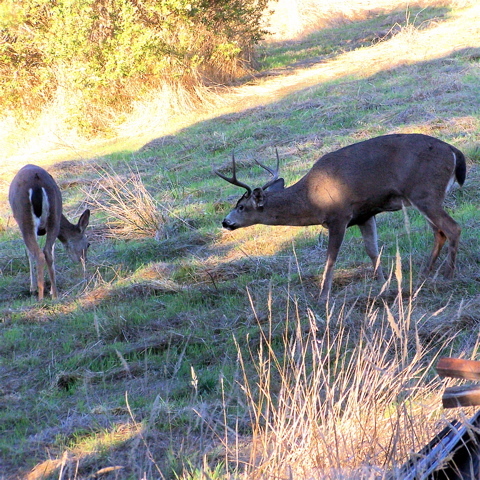 A seemingly perplexed fawn watches as the doe runs away from the buck, who licks his nose in to help pick up her scent. Morris reports that “blacktails have a typical lifespan in the wild of seven to 10 years, but they can survive in suburban habitat for as long as 17 to 20 years if unmolested…. The breeding season is in November, notes Mary Ann Thomas writing about West Coast blacktails from Southern Arkansas University. Gestation lasts about 200 days with typically two fawns born. The fawns’ camouflage spots begin to fade after a month. 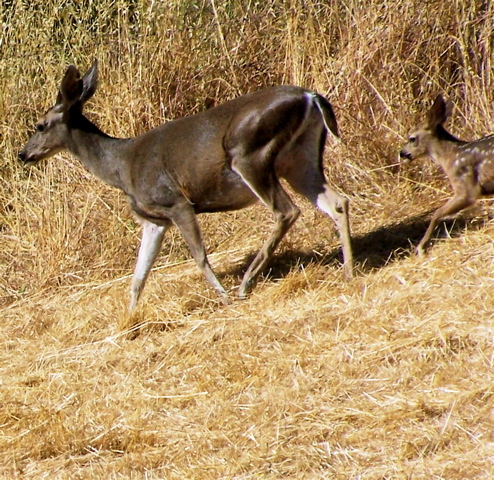 While mountain lions, and occasionally bobcats and coyotes, prey on deer, the biggest threat to West Marin’s blacktails are motor vehicles. In fact, being struck by automobiles is the biggest killer of deer nationwide: more than one million a year. Connecticut alone reported that between 1995 and 2000, the number of deer struck by cars in that state tripled while the number struck by airplanes nationwide has averaged almost one a week for the past 10 years. Or so says Benner’s Gardens, which makes deer-fencing systems. A young buck on his hind legs nibbles on my honeysuckle while his mother watches. This is a wonderful article about the Black tail and your photos are great. 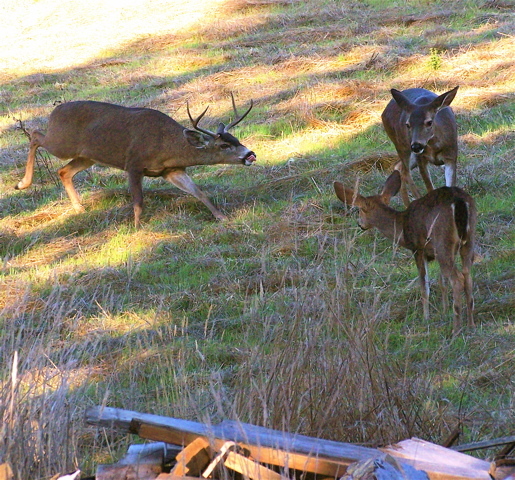 Are you aware that in some areas of West Marin these deer are being kept out of the park by hogwire fences? I have recently had to rescue one from the top two strands of barbed wire which is over the hog wire. 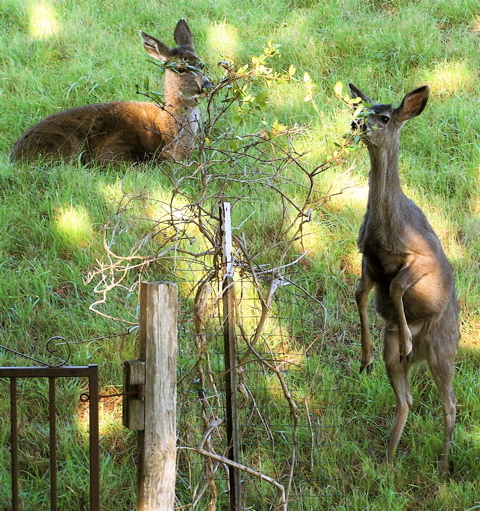 The yearling was attempting to jump the fence and got caught and left hanging by one leg. This same kind of fence is being used extensively in the park in Bolinas. I do not know if it is being used other places. I have written the park to inquire about this since I am aware that previous leases restrict the types of fencing to: (a) barbed wire, (b) high tension wire, (c) electric wire. Each of these are more easily negotiated by wild life. The fawning season is upon us and the fawns cannot follow their mothers over these fences. Sometimes, the does may have to jump the fences to get away from dogs or predators and the fawns are left like bait on the other side of the fences. Sometimes, the fawns get caught in the fences when they try to follow their mothers and are left there to die painful slow deaths. When I spoke with John DeGregoria, range specialist for the Point Reyes National Seashore, he initially told me that “Bill [Niman] has a lifetime lease and can do whatever he wants”. However, when I pointed out to him that previous Special Use Permits clearly specified the types of fencing that can be used and told him where it could be found in the Special Use Permit, he located it (attachment B) and read to me the thee allowable kinds of fencing. He then stated he did not know if these restrictions still apply. I can’t imagine why it would still be part of the Special Use Permit if it doesn’t apply. I also cannot imagine why the park would allow fencing that is detrimental to wildlife. Please join me in voicing your objections to the use of fencing which restricts the free passage of wildlife within the Point Reyes National Seashore. Thank you. Sparsely Sage and Timely is powered by	WordPress 4.9.10 and delivered to you in 0.368 seconds using 52 queries.